As expected, Buffalo Sabres’ general manager Tim Murray drafted American-born center Jack Eichel out of Boston University. Eichel will be the cornerstone of this franchise and have a long and illustrious career. 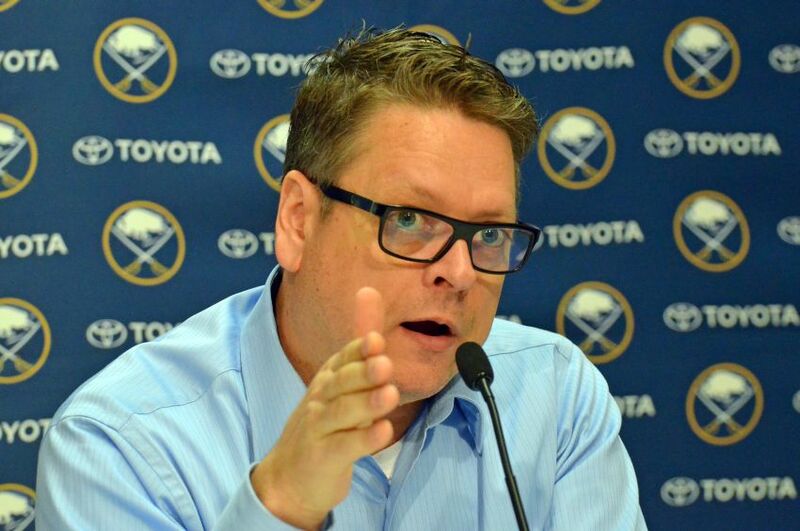 What Eichel did not know is that Murray was going to pull the trigger on draft day trades that would provide the team with players that are expected to help the Sabres turn things around sooner rather than later. While the Sabres currently have their own first round pick, two seconds, and three thirds in the first three rounds of the 2016 draft, Murray has provided the team some talented players with trades made earlier this season as well today’s trades. Back in February of this year, Murray sent defenseman Tyler Myers, right wing Drew Stafford, prospects Joel Armia and Brendan Lemieux, plus a 2015 first-round pick to the Winnipeg Jets for right wing Evander Kane, defenseman Zach Bogosian and goaltending prospect Jason Kasdorf. This was a great trade for the Sabres’ future. Kane is a proven score with 109 goals and 113 assists in 361 NHL games, but did not play at all for the Sabres after recovering from shoulder surgery he had right after the trade. He just started skating last week and will definitely be ready for the upcoming season. Bogosian was drafted third overall in 2008 and Kasdorf just completed his junior season at RPI. Murray’s trades have not only brought in talent, but young talent. Kane is 23, Bogosian is 24, and Kasdorf is 23. Today’s trades continued Murray’s youth movement. Murray acquired potential number one goaltender Robin Lehner from the Ottawa Senators today along with center David Legwand in exchange for the 21st pick in the first round of tonight’s draft. Lehner is only 23 and stands tall at 6’5″. Goaltender was a position of need for the Sabres after trading away Jhonas Enroth and Michael Neuvirth last season. Legwand is a 34 year old center who was the second overall pick in the 1998 draft and adds a veteran presence to the Sabres. The Sabres’ GM was not done wheeling and dealing as he sent defenseman Nikita Zadorov, forwards Mikhail Grigorenko and J.T. Compher, and the 31st pick in this year’s draft to the Colorado Avalanche for 24 year-old center Ryan O’Reilly. At first glance, it may appear the Sabres gave up too much in this trade. However, Grigorenko is a restricted free agent who does not want a two-way contract and is threatening to play in KHL in Russia. Compher is a talented 20 year-old center who is entering his junior season at the University of Michigan. Who knows if he will leave college early? Even so, he may not be ready to make the jump to the NHL from college. Zadarov is only 20 himself and appeared in 60 games for the Sabres last season. I am sad to see Zadarov go, but Bogosian offsets his loss although the Sabres definitely need more defenseman. So it comes down to O’Reilly for the 31st pick which I think is well worth it for the Sabres. O’Reilly has appeared in 427 NHL games already by age 24 and scored 90 goals while Kane has registered 109 goals in 361 NHL games. The number one goaltender job is Lehner’s to lose and Murray is banking on him reaching his full potential in the Sabres’ blue and gold. Add in the immediate impact Eichel is sure to make and the Sabres look to be a competitive team on paper who are well on their way to turning the franchise around.